In recent years, disruptive innovations have proliferated within the food industry. Nevertheless, the question of their acceptability by consumers arises, especially given the previous experience of genetically modified organisms (GMOs). Companies are now facing a societal risk. New players who do not necessarily have economic links with companies, including NGO, radical groups, and media can put pressure on them and even block a project or an innovation. For an innovation to be accepted, its promoter must, at all costs, clear the ground to avoid making it the subject of public controversy. Beyond this general context, key elements must be taken into account if a disruptive food innovation is to be accepted by consumers. The first is the very nature of innovation and its inclusion of “invisible and uncontrollable risks.” The second key element concerns the characteristics of the innovator(s) as well as the conditions for market launch. Large multinational companies are more at risk than local innovators. An innovation will tend to be all the more accepted that it will be developed by a “small” producer, in a short circuit, with an emphasis on nature, tradition and the benefits for health, the environment and society. The acceptability of an innovation does not only depend on the perception of its utility by the consumer. It can also be accepted or rejected because of the “social model” it allegedly embodies. Disruptive innovations create a new market, or transform one or several markets. In recent years, such innovations have proliferated within the food industry, from seed research to the distribution of food products, agricultural production and the industrial processing of agricultural raw materials. This includes genetically modified animals or animal cloning aimed at food production, nanotechnologies applied to food, personalized food, synthetic meat based on textured vegetable proteins or stem cell culture, food products based on edible insects or microalgae, 3D food printers, products from vertical urban farms, food in the form of powder or pills, or even connected diet. Some of these innovations are still at developmental stage in laboratories. Others are awaiting marketing authorization, financing or are about to be released or already on sale. Nevertheless, the question of their acceptability by consumers arises, especially given the previous experience of genetically modified organisms (GMOs), which in some countries resulted in moratoria and bans, left a bitter aftertaste to many actors of the food industry who fear to relive such an experience and see their innovation rejected by consumers. The risk for innovation is therefore not only economic in nature, it is increasingly societal. In recent years, the general context in which innovations of any kind are launched has significantly changed. Companies are now facing a societal risk. New players who do not necessarily have economic links with companies – unlike employees, shareholders, suppliers or customers – have emerged and show a close interest in their activities. We are talking about associations, media or citizens, expressing new requirements towards companies. They can put pressure on them and even block a project or an innovation. Four actors play a key role in this regard. 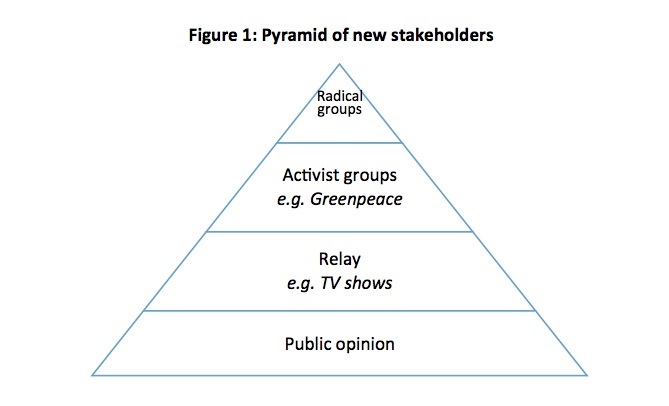 They can be represented in the form of a pyramid (Figure 1): the closer to the top of the pyramid, the fewer their numbers, but the greater the threat they pose to businesses. Hence, at the top of the pyramid, we find radical groups that tend to act illegally and violently by targeting companies. Their numbers are small but they have a great capacity to cause harm and block projects single-handedly. The latter are “militant” groups that act mostly within the law and non-violently (but they may also act illegally, like in France the “Faucheurs volontaires d’OGM” a group of GMO crop destruction activists). Civil society organizations include, among most important examples, the NGO Greenpeace or L214 – an animal welfare association which became widely known for its hidden camera videos filmed in slaughterhouses. These groups are greater in number and they can contribute to the rejection of an innovation. The third players are even more numerous. They relay the vision of militant groups to the general public. These include journalists, authors, directors, but also politicians and even mass distribution. Finally, the base of the pyramid represents the public opinion. The goal of militant groups and relays is both to capture the attention of the opinion and to convince them of the correctness of their vision. Indeed, the public opinion, and ultimately the consumer, become the tipping point between acceptance and rejection of a given innovation, which is then submitted to a “popular veto.” Within public opinion, the group that certainly needs to be convinced today, it that of executives and, more specifically, young urban executives, because they are increasingly becoming the main standard setters of consumption. If these four actors unanimously reject an innovation, the latter will be significantly harder to sell, as seen with GMOs. On the other hand, if an innovation needs to be accepted, its promoter must, at all costs, clear the ground to avoid making it the subject of public controversy. Beyond this general context, three key elements must be taken into account if a disruptive food innovation is to be accepted by consumers. The first is the very nature of innovation. The work of Paul Slovic and his team since the 1970s, and of other researchers in more recent times, have shown how specific risks tend to provoke anxiety among people. This is particularly the case with invisible and uncontrollable risks, such as radioactive waste, pesticide residues or genetic modifications. Food innovations with these characteristics, such as GMOs, will be more difficult to accept, especially if they appear as subject to scientific uncertainty and have a potential impact on human health. But this is not necessarily prohibitive because most of the time, consumers do not evaluate risk in itself, but in balance with the expected potential benefits. Hence, if they tend to believe that, despite the risks involved, the expected benefit of an innovation is high enough for themselves and/or society as a whole, they will be more inclined to accept it. On the other hand, an innovation perceived rightly or wrongly as risky, or of little use, will be difficult to accept. At this stage, genetically modified or cloned animals, nanotechnologies in the food industry or in vitro meat could be seen by consumers as high-risk factors, while offering low or average benefits. The second key element concerns the characteristics of the innovator(s) as well as the conditions for market launch. In some countries, an innovation carried out by a multinational US company for commercial purposes, including patenting living things, especially if it already has a negative image – e.g. a company such as Monsanto – is less likely to be accepted than an innovation developed by public research institutions or local startups created by young engineers – for example, the production of food derived from insects or micro-algae. There might be a dichotomy in the eyes of consumers between local and foreign companies, small and large companies, the public sector and the private sector, or between companies that are symbols of globalization and unbridled capitalism and those that are more deeply rooted as symbols of family and “social” capitalism. The least favorable situation for the acceptability of an innovation will then be the fact that it is developed by a large foreign private company that symbolizes globalization. In such a case, it will be even less accepted that its usefulness doesn’t appear as clearly to the consumer, who will then draw the conclusion that its only aim is commercial and therefore, that the company develops the product for profitability (to improve the yields or reduce the costs of production) and perhaps, in disregard of health and environment. The conditions for the market launch of innovation are equally important. Innovation will be all the more acceptable if its market authorization follows a public consultation. Furthermore, product traceability will label all products derived from this innovation so that the consumer may knowingly decide whether to buy it or not. In such a context, nanotechnologies applied to food – titanium dioxide, for example – seem to be quite problematic because they are developed by agribusiness giants and are launched on the market without prior marketing authorization. The third element is the contextual and structural feature of the food innovation announcement or launch. The economic situation is also an important factor. A breakthrough food innovation launched while the public is still under the shock of a food crisis, or even a health crisis without even a loose connection with food, will certainly undermine the conditions of its acceptability. For instance, GMOs (in this case, transgenic soy) were launched in France in 1996, in the midst of the mad cow crisis. Not the best timing indeed. Innovators must also take into account a number of structural trends. First of all, in recent years, in developed countries, a growing number of people believe, rightly or wrongly, that the quality of food has deteriorated. Fears concerning food are also rising noticeable. It is not a question of fear of food scarcity or intoxication, but of slow and insidious poisoning due to the regular ingestion of chemicals (such as pesticide residues) that may cause cancers or other serious diseases on the medium and long term. This is reflected, in particular, in the spectacular growth of the market of organic, non-GMO, gluten-free, lactose-free products, etc. Other consumer trends in relation to food can also be observed: a tendency to trust more spontaneously “small” than “big,” to value local over global (and therefore, short rather than long circuits), vegetarian over meat, everything that is perceived as “natural” over industrial processed food (especially, if chemical processes have been used during its production), tradition over novelty and, ultimately, the common good over private interest. Genetically modified animals developed to increase yields, such as the GM salmon, are likely to be rejected because they reinforce a mode of production (intensive farming) that is already heavily criticized. In such a context, an innovation will tend to be all the more accepted that it will be developed by a “small” producer, in a short circuit, with an emphasis on nature, tradition and the benefits for health, the environment and society. On the other hand, an innovation carried out by a “big” producer, in an industrial and commercial logic, will be potentially less acceptable. In fact, what is clearly questioned by the public opinion in developed countries is the dominant model of production in the food industry i.e. based on conventional agriculture and boosted by GMOs and giant farms, the industrial transformation of raw materials, the distribution via mass distribution, the predominant role of multinational firms and the globalization of these processes. This has been called by some “food modernity.” Food innovations will therefore be more likely to be accepted if they are “disruptive” in relation with this dominant model, while those that tend to improve and even strengthen this situation will tend to be rejected. For example, while insect consumption may be perceived as disgusting by some consumers, food innovations based on insects are not necessarily rejected (which does not mean that consumption will develop), probably because of their “disruptive” nature. These innovations are developed by start-ups that insist on the benefits for the environment (especially compared to the conventional production of meat) and target young urban executives. On the other hand, genetically modified animals developed to increase yields, such as the GM salmon, are likely to be rejected because they reinforce a mode of production (intensive farming) that is already heavily criticized. The latter refers to a world shaped by science and technology, characterized by deregulated capitalism, hyper-industrialization and mass production of ultra-processed food, globalization of trade and production, the predominant role played by big multinational companies, mass consumption, hypermaterialism and hyperindividualism. However, young urban executives seem more sensitive to a world that combines the best of food modernity (abundance, efficiency, practicality, etc.) and the best of tradition (“naturalness,” proximity, simplicity, etc.). This can be characterized as a post-modern vision. It responds to the opportunity offered by digital platforms, ultimate symbols of modernity, to buy products directly from the farm. This is also reflected in a growing quest for autonomy by consumers who wish to “regain control” and reclaim what they had previously delegated to external entities (industry, mass distribution). La Marque du Consommateur in France (lit. The Consumer’s Brand) or movements such as Makers that promote DIY are among the best examples. In such a context, an innovation will be all the more accepted as it meets these needs. If we take, for example, the case of 3D food printers, this innovation should probably be rejected as a device created by hypermodernity to design ultra-transformed food (3D printing of meat from stem cells), quite a repelling symbol. On the other hand, it could be accepted if it embodies technological modernity at the service of a return to natural products and consumer autonomy. This approach was chosen by the company Natural Machines to market a 3D printer called Foodini. According to them, this technology will help consumers to make at home what manufacturers produce in a factory, hence giving them back the control over the process of designing food. In a way, they offer all the advantages of modernity and tradition, without the associated drawbacks. Are Indian consumers concerned about GM food?